2 What is this option about? 4 What is health? 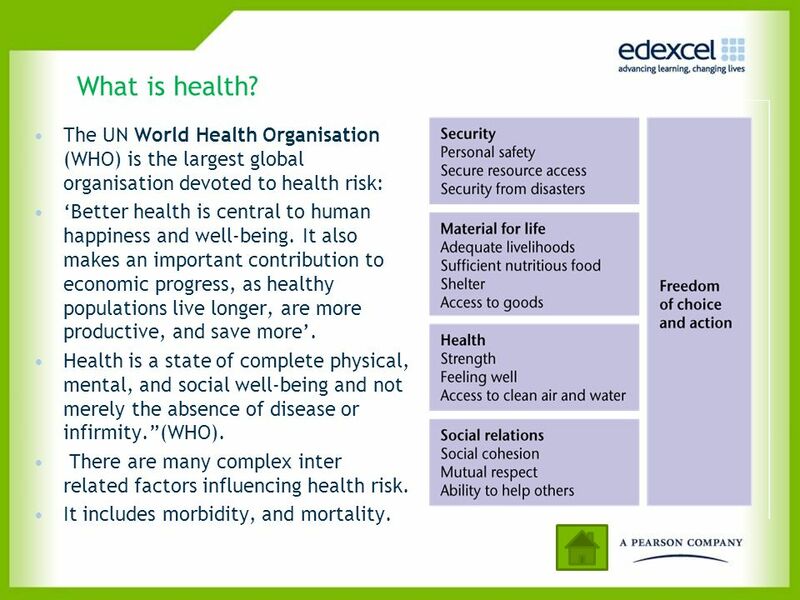 The UN World Health Organisation (WHO) is the largest global organisation devoted to health risk: ‘Better health is central to human happiness and well-being. It also makes an important contribution to economic progress, as healthy populations live longer, are more productive, and save more’. Health is a state of complete physical, mental, and social well-being and not merely the absence of disease or infirmity.”(WHO). 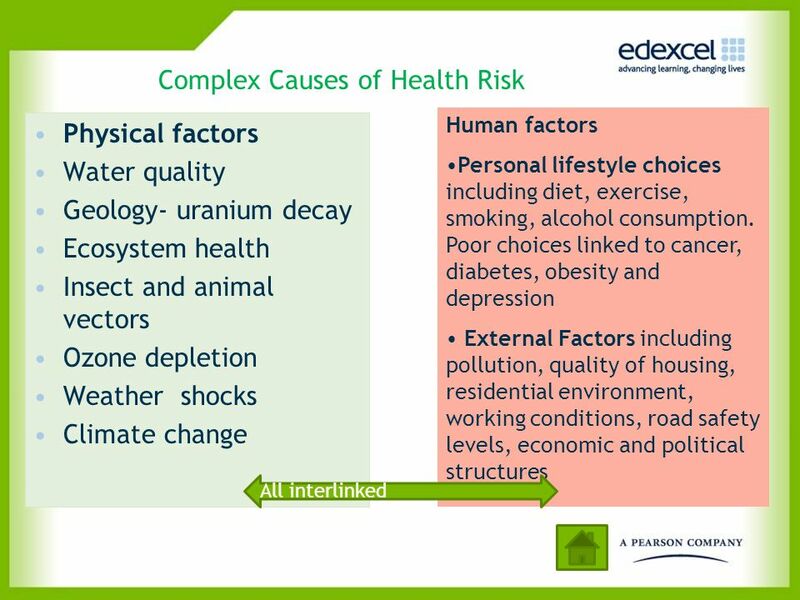 There are many complex inter related factors influencing health risk. It includes morbidity, and mortality. 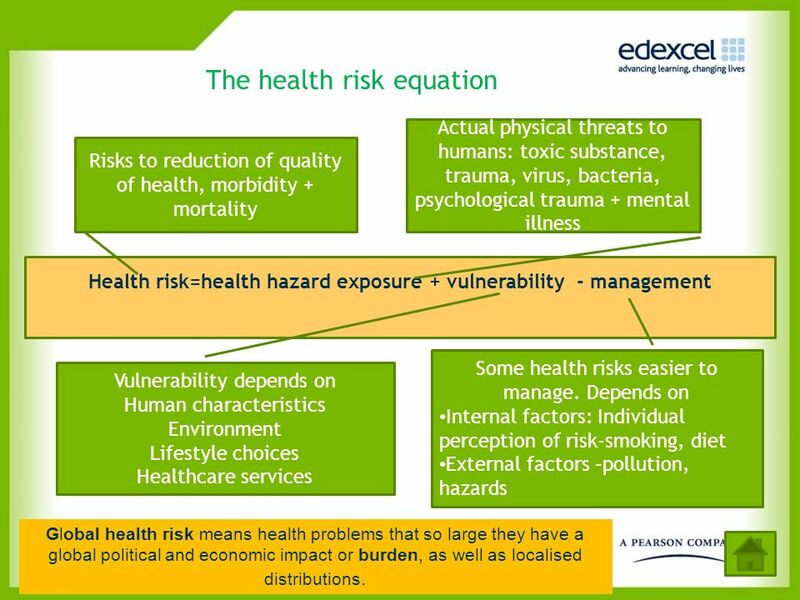 Actual physical threats to humans: toxic substance, trauma, virus, bacteria, psychological trauma + mental illness Risks to reduction of quality of health, morbidity + mortality Health risk=health hazard exposure + vulnerability - management Some health risks easier to manage. 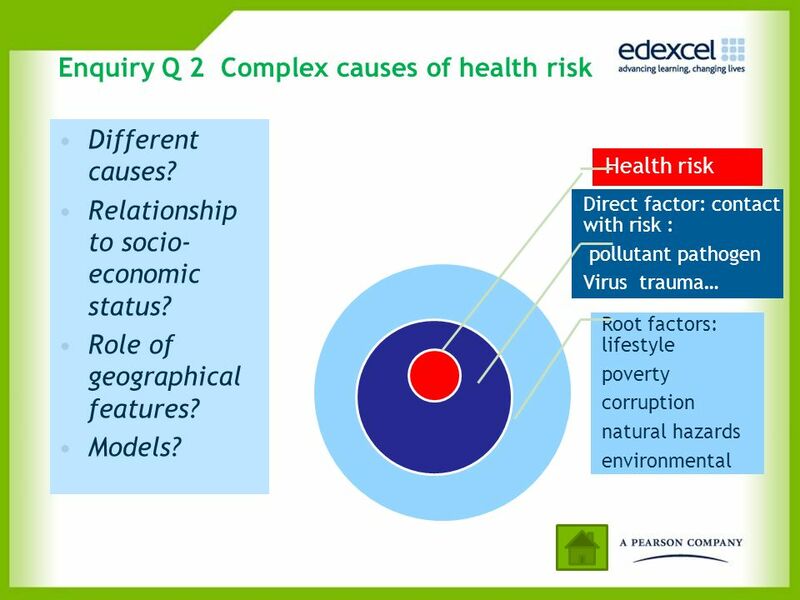 Depends on Internal factors: Individual perception of risk-smoking, diet External factors –pollution, hazards Vulnerability depends on Human characteristics Environment Lifestyle choices Healthcare services Global health risk means health problems that so large they have a global political and economic impact or burden, as well as localised distributions. 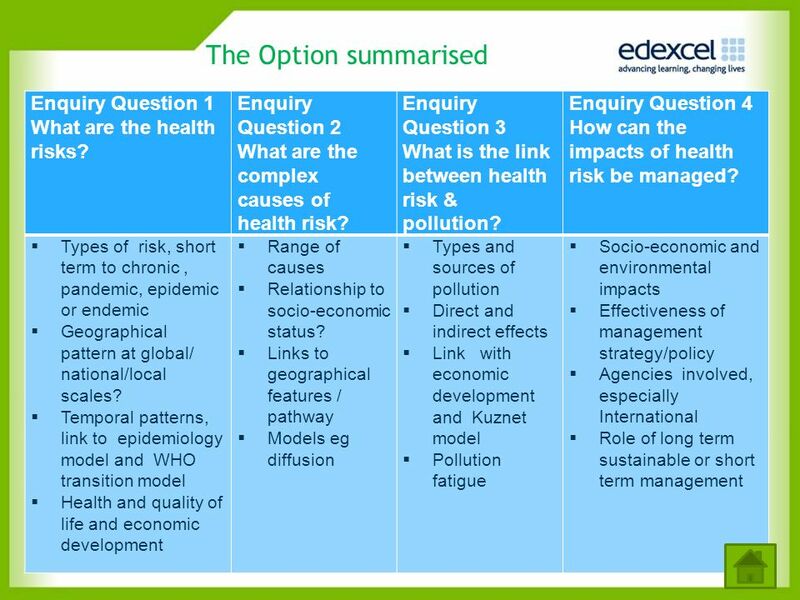 6 The Option summarised Enquiry Question 1 What are the health risks? 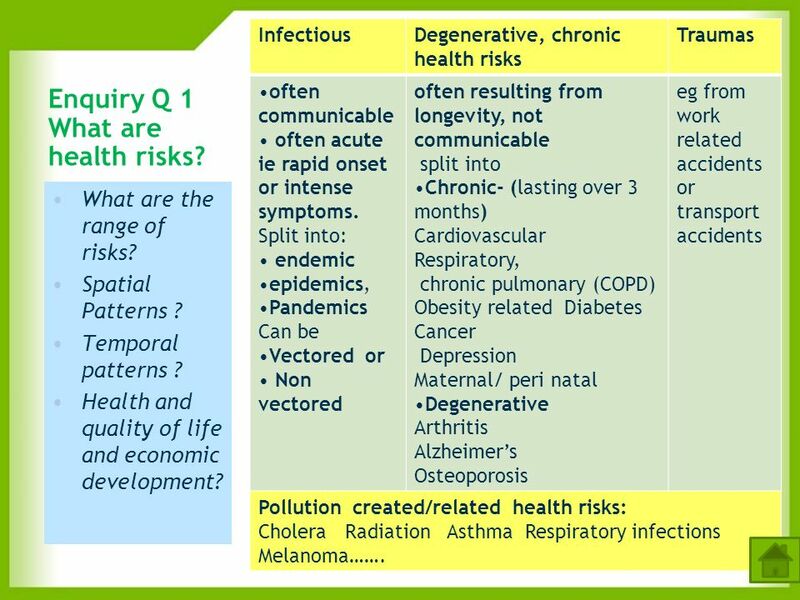 7 Enquiry Q 1 What are health risks? Infectious Degenerative, chronic health risks Traumas often communicable often acute ie rapid onset or intense symptoms. Split into: endemic epidemics, Pandemics Can be Vectored or Non vectored often resulting from longevity, not communicable split into Chronic- (lasting over 3 months) Cardiovascular Respiratory, chronic pulmonary (COPD) Obesity related Diabetes Cancer Depression Maternal/ peri natal Degenerative Arthritis Alzheimer’s Osteoporosis eg from work related accidents or transport accidents Pollution created/related health risks: Cholera Radiation Asthma Respiratory infections Melanoma……. 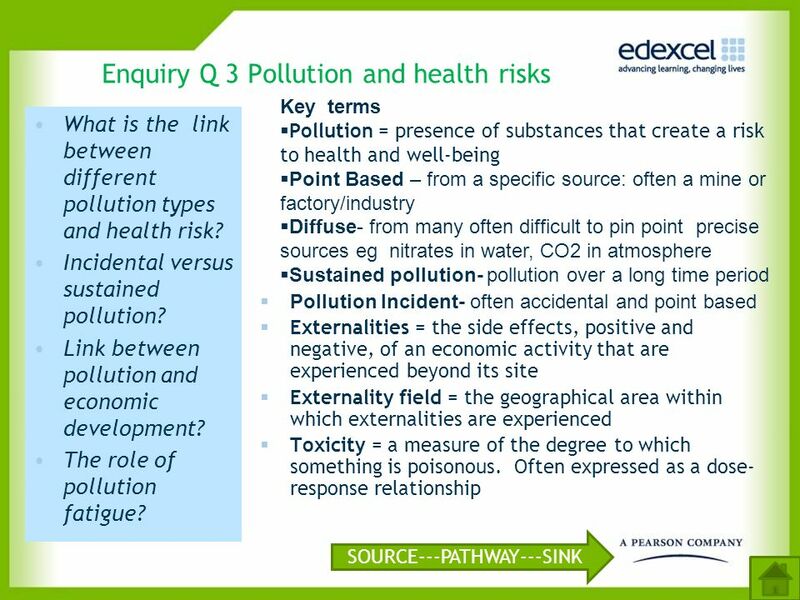 Enquiry Q 1 What are health risks? 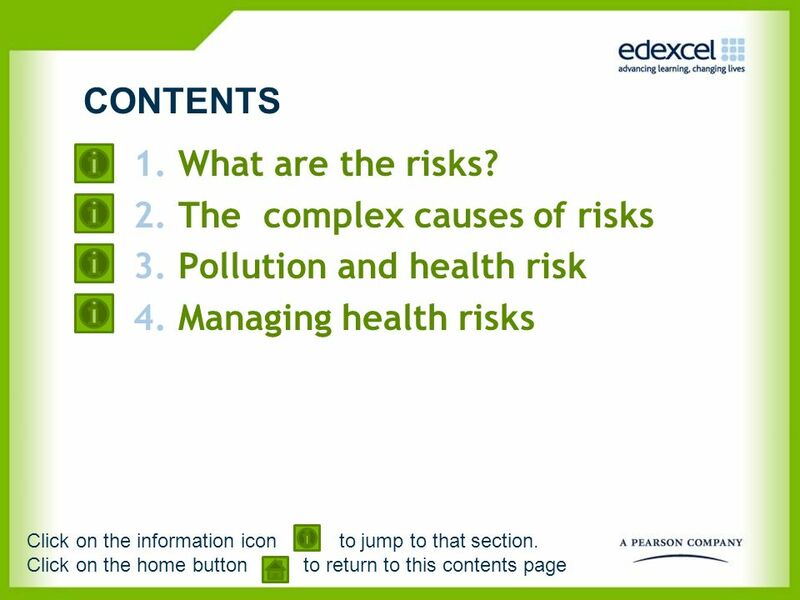 What are the range of risks? Spatial Patterns ? Temporal patterns ? Health and quality of life and economic development? 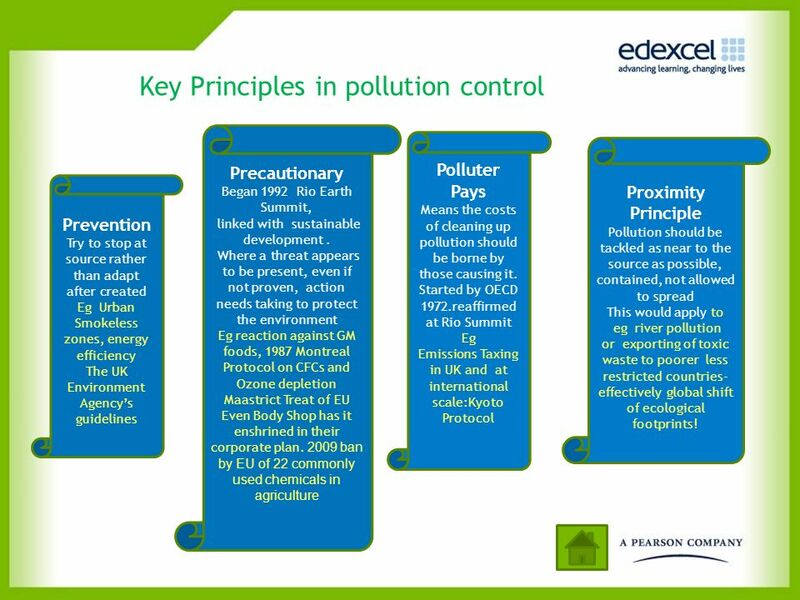 Direct factor: contact with risk : pollutant pathogen Virus trauma… Root factors: lifestyle poverty corruption natural hazards environmental…. Different causes? 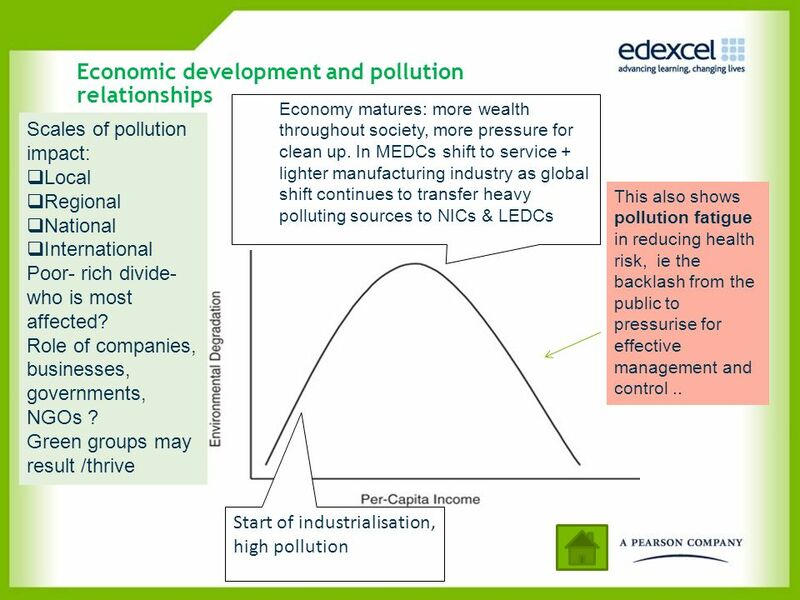 Relationship to socio-economic status? 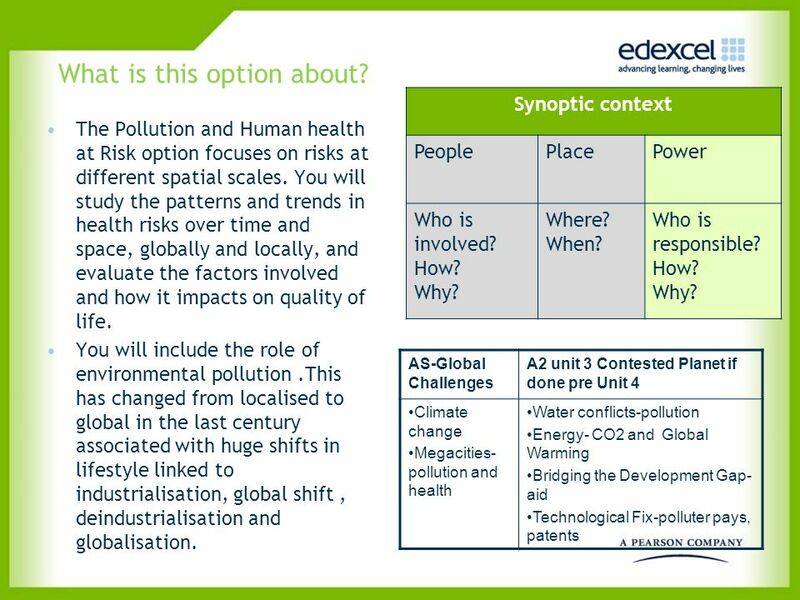 Role of geographical features? Models? 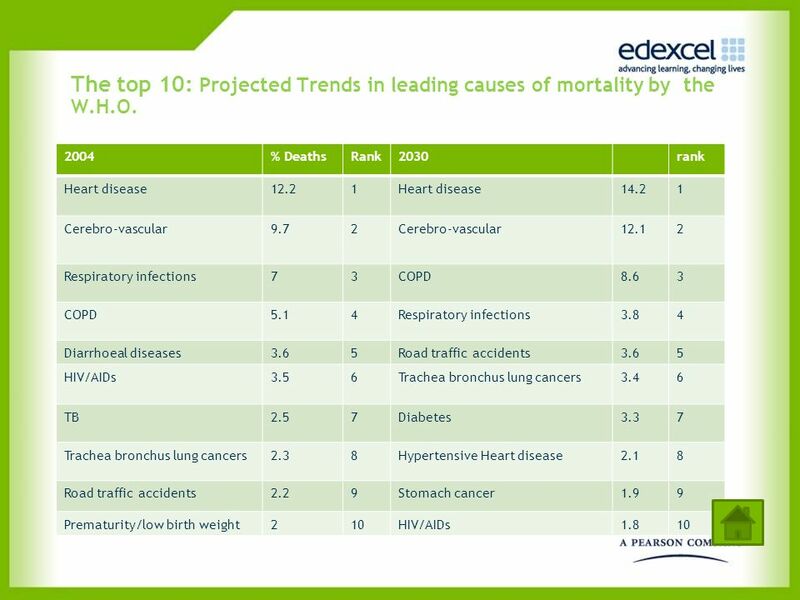 13 The top 10: Projected Trends in leading causes of mortality by the W.H.O. 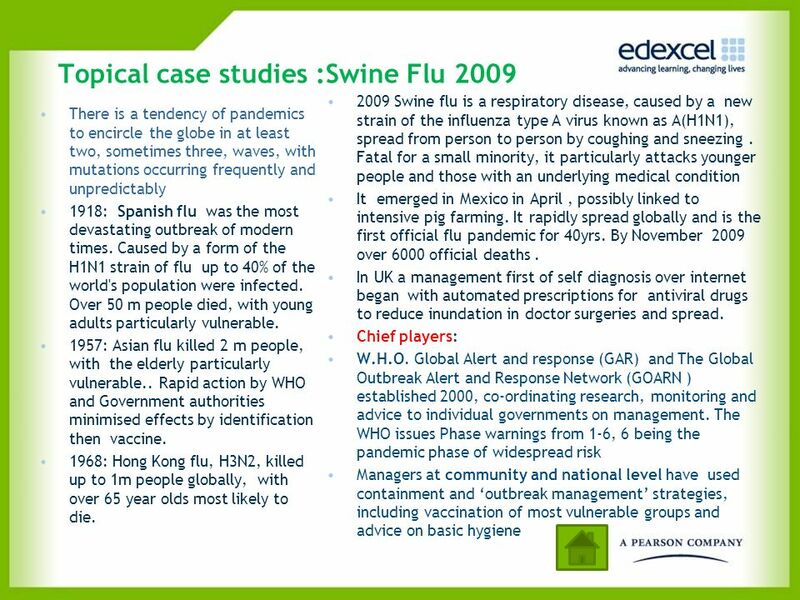 2009 Swine flu is a respiratory disease, caused by a new strain of the influenza type A virus known as A(H1N1), spread from person to person by coughing and sneezing . Fatal for a small minority, it particularly attacks younger people and those with an underlying medical condition It emerged in Mexico in April , possibly linked to intensive pig farming. It rapidly spread globally and is the first official flu pandemic for 40yrs. By November over 6000 official deaths . In UK a management first of self diagnosis over internet began with automated prescriptions for antiviral drugs to reduce inundation in doctor surgeries and spread. Chief players: W.H.O. 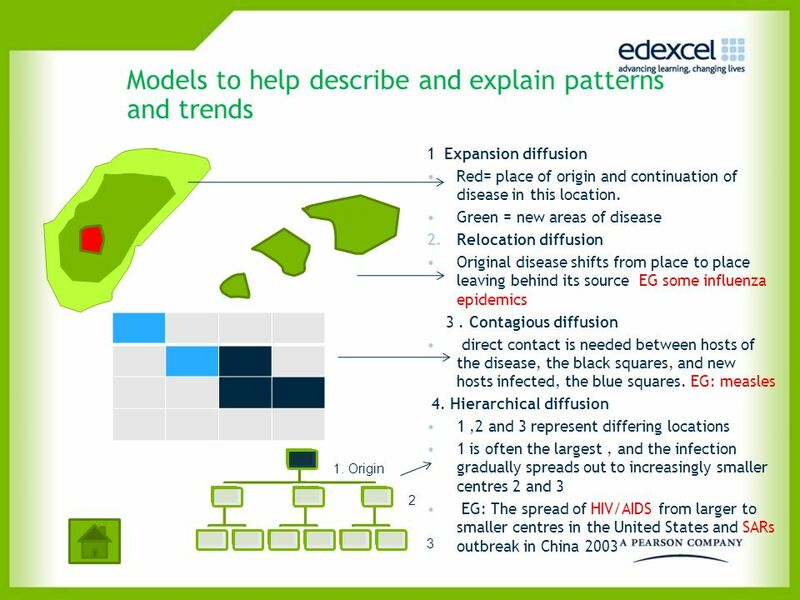 Global Alert and response (GAR) and The Global Outbreak Alert and Response Network (GOARN ) established 2000, co-ordinating research, monitoring and advice to individual governments on management. The WHO issues Phase warnings from 1-6, 6 being the pandemic phase of widespread risk Managers at community and national level have used containment and ‘outbreak management’ strategies, including vaccination of most vulnerable groups and advice on basic hygiene There is a tendency of pandemics to encircle the globe in at least two, sometimes three, waves, with mutations occurring frequently and unpredictably 1918: Spanish flu was the most devastating outbreak of modern times. Caused by a form of the H1N1 strain of flu up to 40% of the world's population were infected. Over 50 m people died, with young adults particularly vulnerable. 1957: Asian flu killed 2 m people, with the elderly particularly vulnerable.. Rapid action by WHO and Government authorities minimised effects by identification then vaccine. 1968: Hong Kong flu, H3N2, killed up to 1m people globally, with over 65 year olds most likely to die. 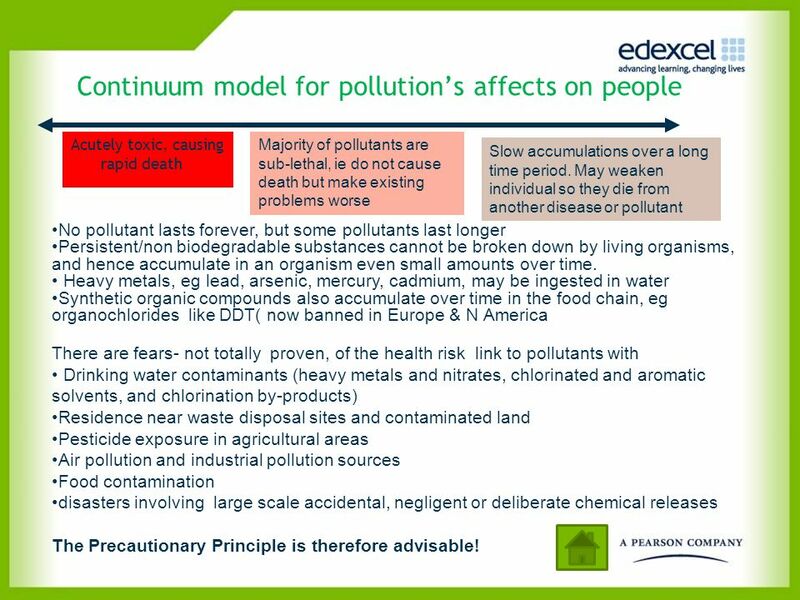 Acutely toxic, causing rapid death Majority of pollutants are sub-lethal, ie do not cause death but make existing problems worse Slow accumulations over a long time period. May weaken individual so they die from another disease or pollutant No pollutant lasts forever, but some pollutants last longer Persistent/non biodegradable substances cannot be broken down by living organisms, and hence accumulate in an organism even small amounts over time. Heavy metals, eg lead, arsenic, mercury, cadmium, may be ingested in water Synthetic organic compounds also accumulate over time in the food chain, eg organochlorides like DDT( now banned in Europe & N America There are fears- not totally proven, of the health risk link to pollutants with Drinking water contaminants (heavy metals and nitrates, chlorinated and aromatic solvents, and chlorination by-products) Residence near waste disposal sites and contaminated land Pesticide exposure in agricultural areas Air pollution and industrial pollution sources Food contamination disasters involving large scale accidental, negligent or deliberate chemical releases The Precautionary Principle is therefore advisable! 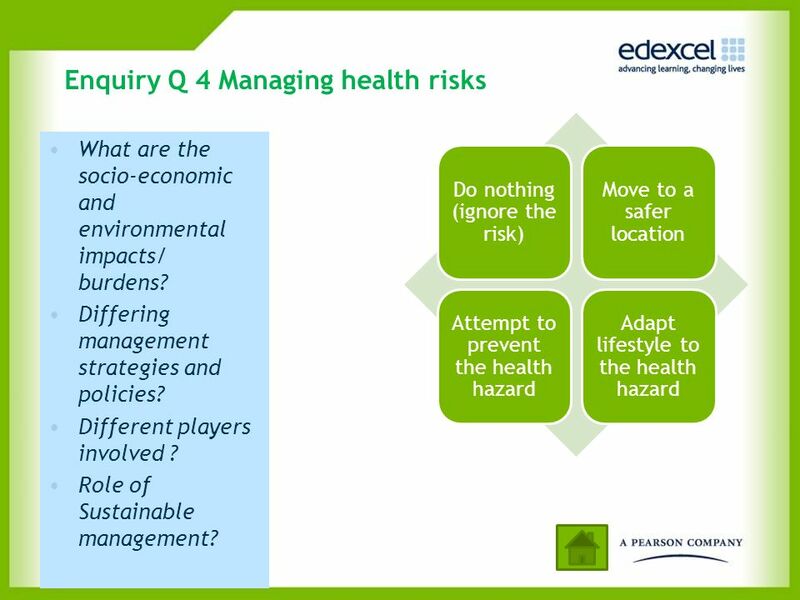 Do nothing (ignore the risk) Move to a safer location Attempt to prevent the health hazard Adapt lifestyle to the health hazard What are the socio-economic and environmental impacts/ burdens? Differing management strategies and policies? Different players involved ? Role of Sustainable management? 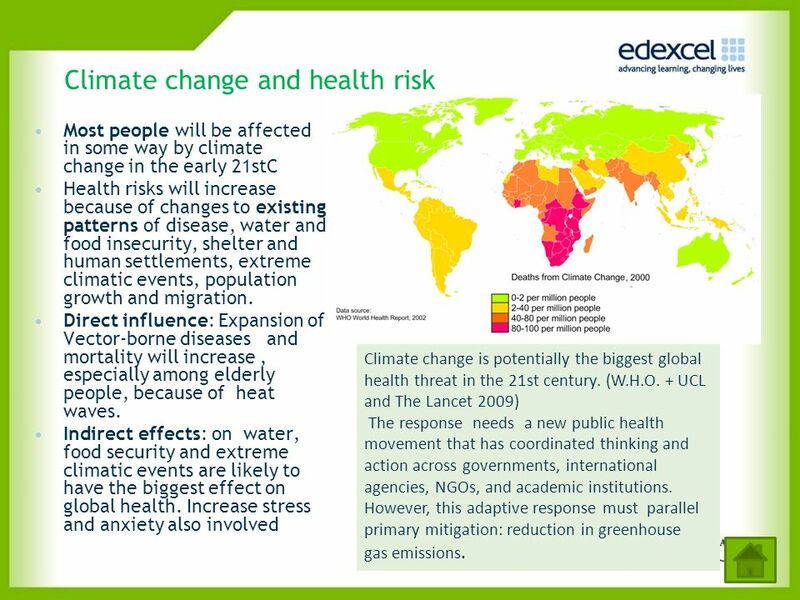 Most people will be affected in some way by climate change in the early 21stC Health risks will increase because of changes to existing patterns of disease, water and food insecurity, shelter and human settlements, extreme climatic events, population growth and migration. 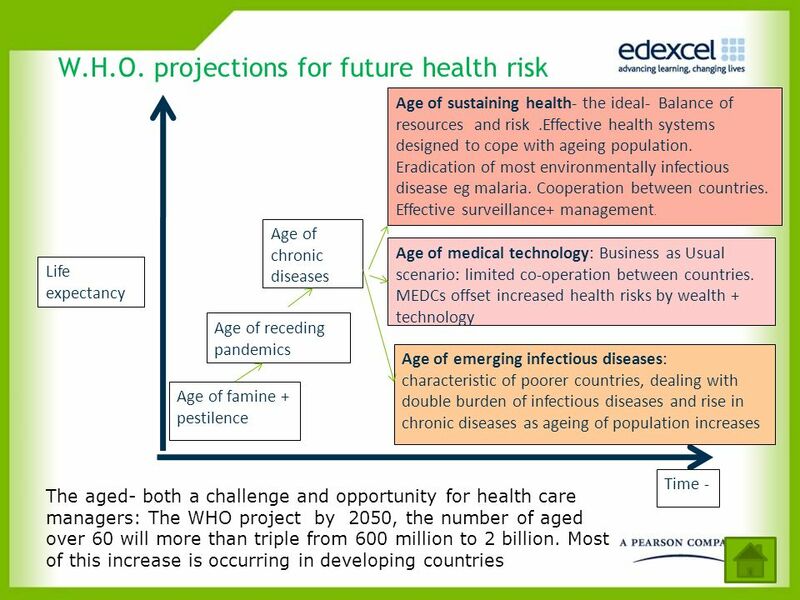 Direct influence: Expansion of Vector-borne diseases and mortality will increase , especially among elderly people, because of heat waves. 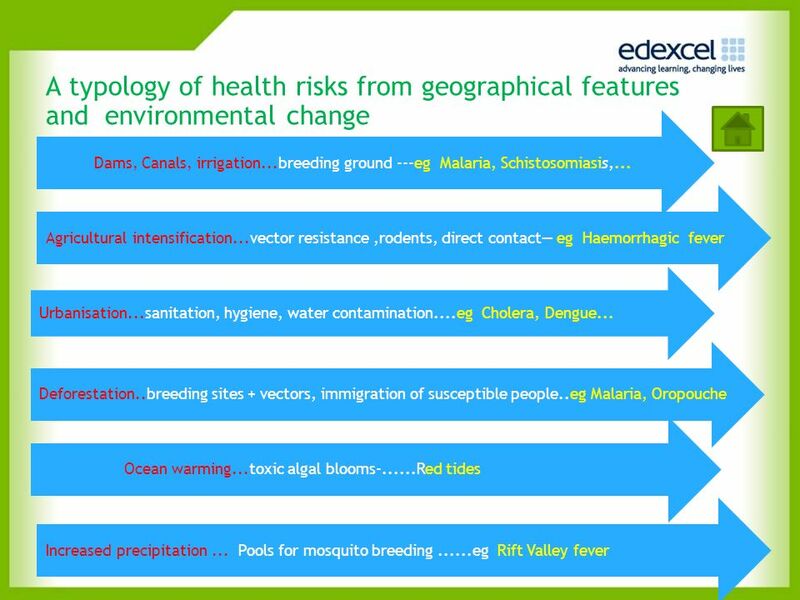 Indirect effects: on water, food security and extreme climatic events are likely to have the biggest effect on global health. Increase stress and anxiety also involved Climate change is potentially the biggest global health threat in the 21st century. (W.H.O. 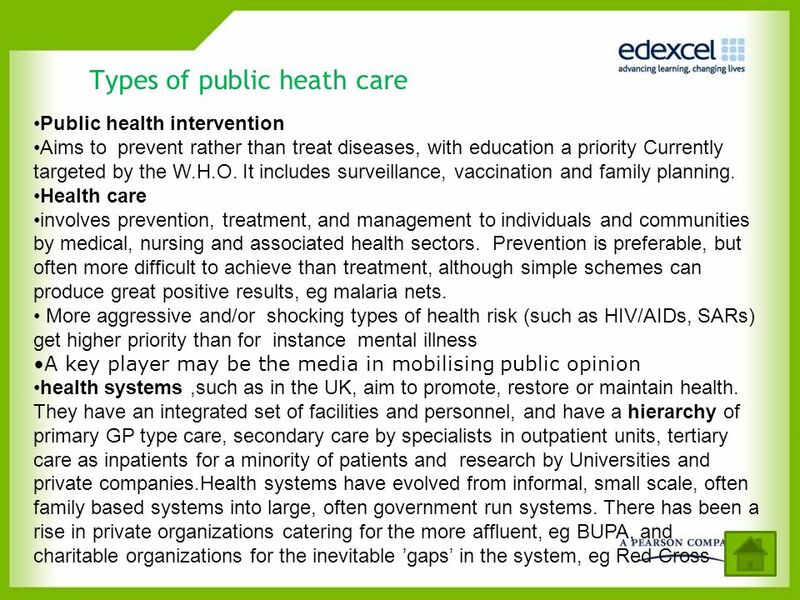 + UCL and The Lancet 2009) The response needs a new public health movement that has coordinated thinking and action across governments, international agencies, NGOs, and academic institutions. However, this adaptive response must parallel primary mitigation: reduction in greenhouse gas emissions. 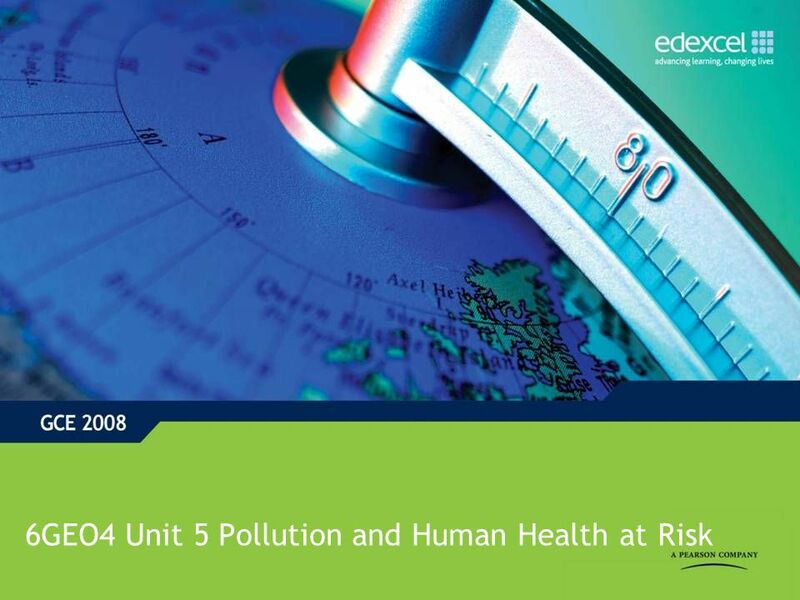 Growth of international efforts to tackle health risks is linked to the increasing scale and issues involved globalisation and interconnectivity of world economies ,political and financial affiliations, and flows of people and technology International minimum and ambient standards are now common in both health and pollution management. These are funded by international institutions like the United Nations or World Bank, or philanthropic NGOs ranging from Oxfam to the Bill and Melinda Gates Foundation. TNCs also play a role. However, it still comes down to individual nations and indeed individuals whether these policies can actually be implemented effectively. In 2000, the largest-ever gathering of Heads of State adopted the Millennium Declaration, endorsed by 189 countries. 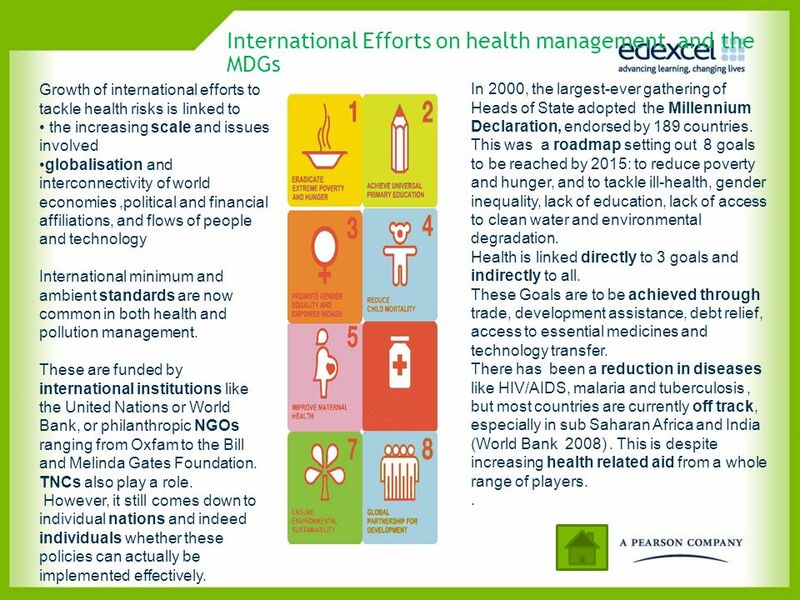 This was a roadmap setting out 8 goals to be reached by 2015: to reduce poverty and hunger, and to tackle ill-health, gender inequality, lack of education, lack of access to clean water and environmental degradation. Health is linked directly to 3 goals and indirectly to all. These Goals are to be achieved through trade, development assistance, debt relief, access to essential medicines and technology transfer. There has been a reduction in diseases like HIV/AIDS, malaria and tuberculosis , but most countries are currently off track, especially in sub Saharan Africa and India (World Bank 2008) . 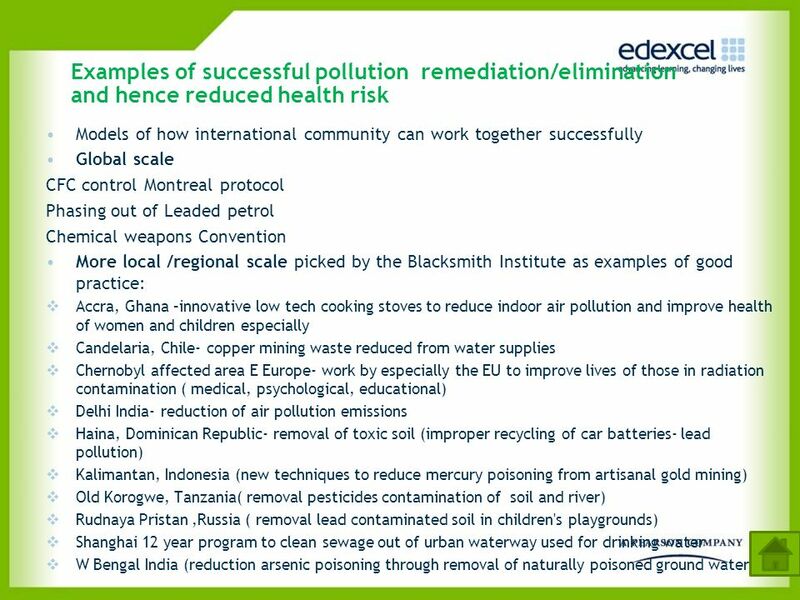 This is despite increasing health related aid from a whole range of players. .
Download ppt "6GEO4 Unit 5 Pollution and Human Health at Risk"
The UK response: adaptation and mitigation strategies Professor Dame Sally C Davies Director General Research and Development Department of Health. 1 Translation of Research Findings for Prevention and Control of NCDs Shanthi Mendis Chronic Disease Prevention and Management World Health Organization. JOINT EVALUATION UNIT – April Why are Result & Impact Indicators Needed? To better understand the positive/negative results of EC aid. The main. Health, place and nature How outdoor environments influence health and well-being. 1 European Community Development Policy. 2 GENERAL CONTEXT world-wide.. Trade and investment liberalisation Technological revolution - Information Society. Preventing chronic disease and promoting sustainable social policy Anna Coote Commissioner for Health, UKSDC December 2007. 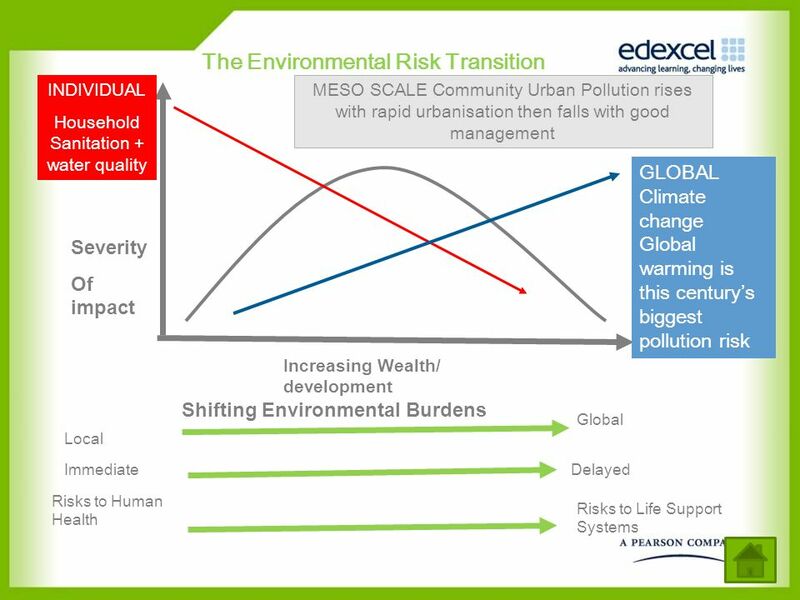 Why equity and sustainability? How can we….  Maintain progress in ways that are equitable and that do not harm the environment?  Meet the development. BMA Medical College and Vajira Hospital Urban health care Chavanant Sumanasrethakul MD., M.Sc. Department of Preventive and Social Medicine. 1. 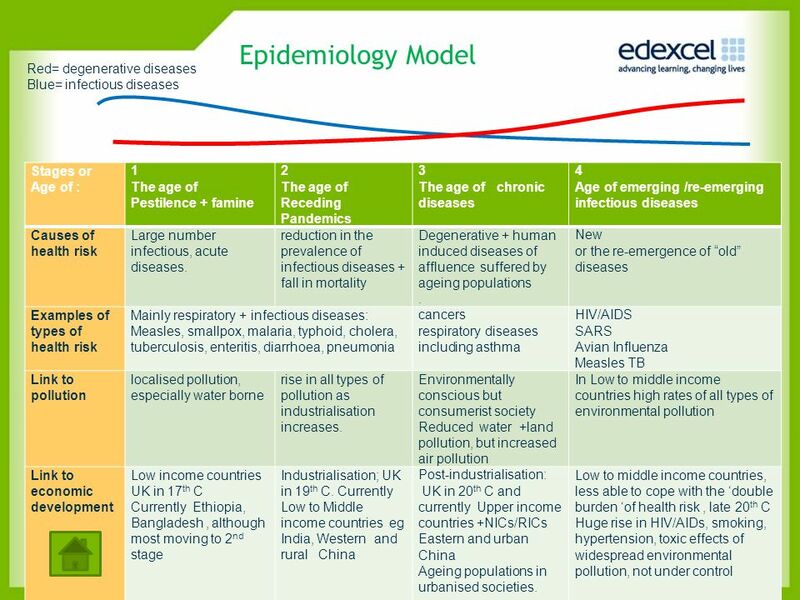 Objectives In this session, all the participants will able to : Define Epidemiology. Define Epidemiologic Transition. Explain the theory of Abdel Omran. Population & Environment II ES 118 Spring Life expectancy 20 th Century saw global transformation of human health 20 th Century saw global transformation. 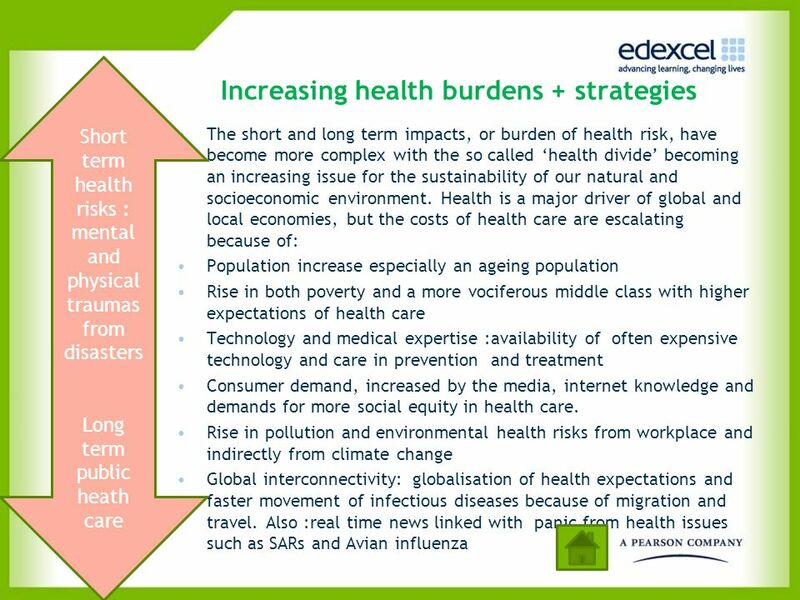 Climate change and health. Climate Change and Health The topic will evolve and advance rapidly these first two decades of this century. Researchers are. 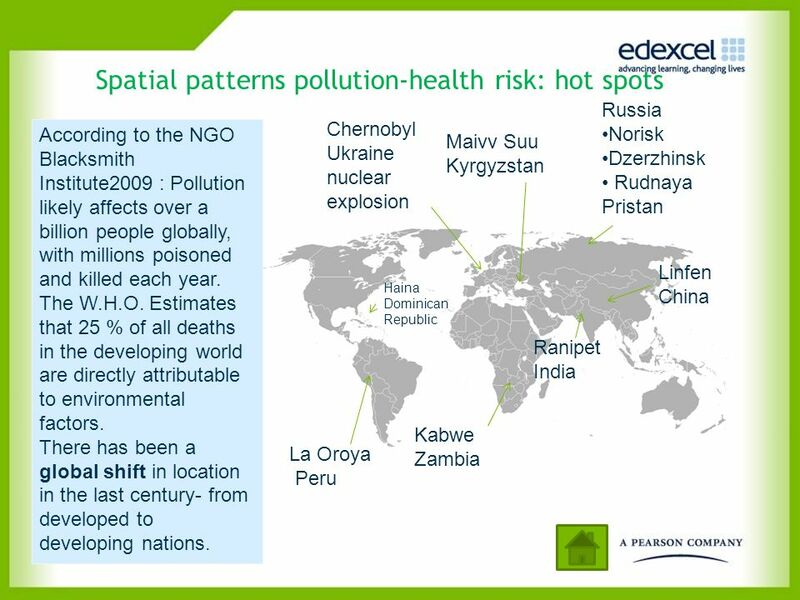 Harvard University Initiative for Global Health Global Health Challenges Social Analysis 76: Lecture 17. 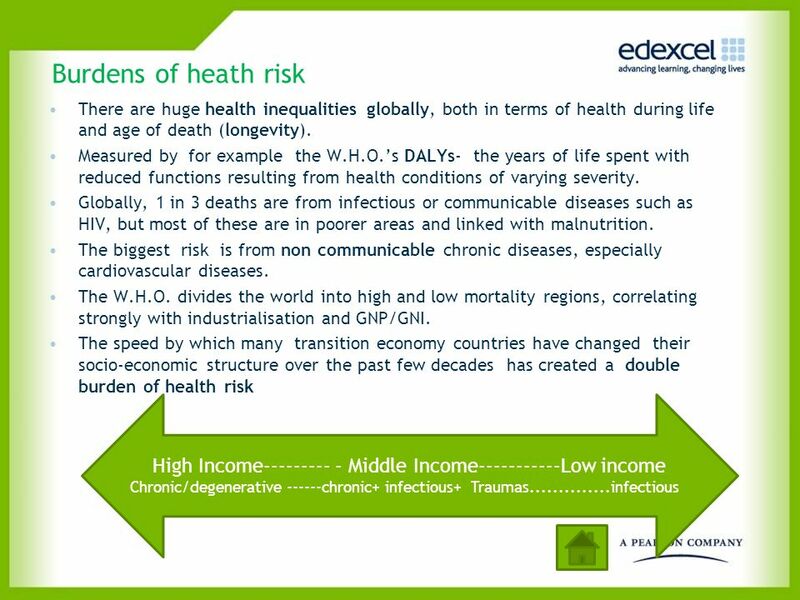 Mortality Rates LEARNING OBJECTIVES 1.TO DEFINE THE DIFFERENT MEASUREMENTS OF MORTALITY 2.TO IDENTIFY THE DIFFERENT GLOBAL MORTALITY TRENDS. 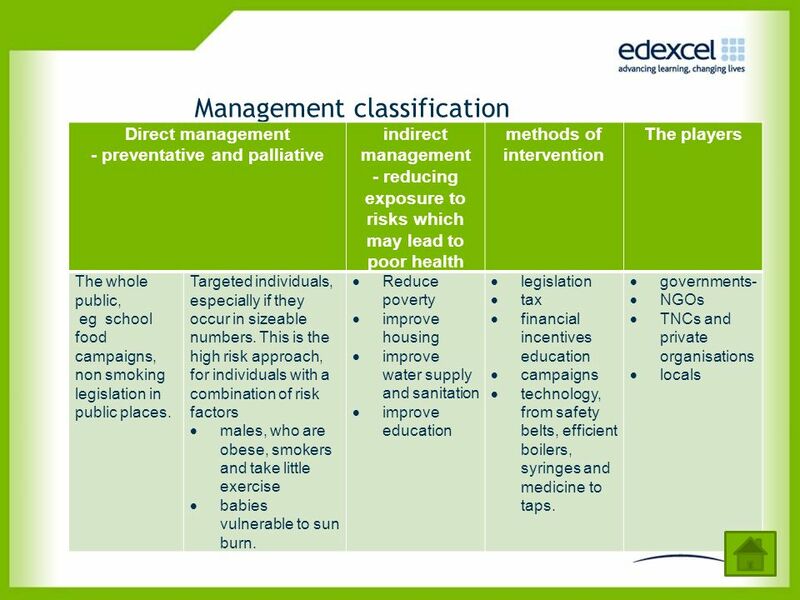 ENDEMIC: a disease habitually present in an area due to a permanent local cause e.g. malaria and cholera EPIDEMIC: a disease prevalent among a group at.